To develop the skills of individuals with disabilities by providing opportunities for suitable sustainable employment that result in greater independence. We have recently added a member of the ODC to our staff. It is a great opportunity to be able to empower an individual with disabilities to carry on a job like the other staff members. She has developed relationships with both staff and residents which is great for all involved. We look forward to being able to help more individuals from the ODC to become a part of our great team! We appreciate our longstanding relationship with the ODC. The individual we’ve had working with us for many years is very safety-conscious, highly motivated and is a flexible, dependable member of our team. He's great with communicating when supplies are low or when there's a problem, which shows he really cares about his job and takes pride in his work. Everyone has gained a new friend with him. We are proud to have individuals employed through ODC come every weekday and faithfully clean our three-floor building, taking care of all the floors, stairs, offices, conference rooms and bathrooms. They are very dedicated to their work and do a great job! It is always a pleasure to see and interact with them daily as they are starting their shift and we are ending ours. Their pride and dedication is evident in the clean offices we come into at the beginning of every new day. We also have a group of dedicated people that come a few times a week with support staff to collect our shredding, which is then taken back to the center to be processed. They too are very proud of what they do and of their designated roles they have in this process. It is wonderful that these individuals have the opportunity to serve us through their perseverance and pride-filled work. Grizzly Truss values our relationship with the ODC. We've had Brian working with us for the past year, and it has been truly enjoyable watching him grow into becoming a more independent individual. He stays busy on his own, knows what needs to get done every day, and takes it upon himself to help others with tasks such as loading windows and doors on the trucks. It feels good knowing we're helping empower Brian by providing this opportunity to learn and grow. They at the ODC are defined by their hard work and infectious personalities, not their disabilities. Lone Oak Family Dentistry believes in Empowering All, and we have seen our friends at the ODC not only be great employees for our office, but for our whole community. They inspire us with their work ethic and together great bonds are formed through this partnership of empowerment! At Warroad Senior Living Center, we are proud to have members of ODC at our facility. We hope to assist our friends with meaningful tasks that help them feel empowered as an individual and community member. The quality of the relationships that have been developed are beyond those of a coworker but more like family. We appreciate the superior efforts given each day, and look forward to what the future will hold for all. Titan Machinery in Roseau has had the fine employees from ODC coming to help us out for quite a few years now. Their strong work ethic and hard work is very much appreciated. We look forward to them coming over and whipping the place back into shape! They are so eager to please, and they always approach the tasks-at-hand with determination and the utmost desire to do the best job they can. They are great people that you end up truly caring about. I believe the sense of empowerment not only comes from doing a great job and knowing you make a difference and are needed, but also comes from knowing that you’ve developed friendships with people that really care about you. It’s a definite win/win for all! Hometown Hardware Hank in Baudette has been using the services of ODC for several years now, and will continue to do so. Their staff works hard to do their best and it shows! We receive compliments on the cleanliness of our store all the time. We consider their employees as part of our team; we care about them and how they feel about themselves and their jobs. With Briana it's the little things we've truly come to appreciate over our years of working together. She comes in once a week to clean our facilities, but it's more than custodial work she does. She takes care of us, keeping us healthy through her attention to detail when sanitizing doorknobs and light switches, and easily adapts to the needs of our office, like turning off the vacuum when the phone rings. She cares about her job, taking pride in her work and is as reliable as the sunrise. Briana is a part of our family and brightens the day for us and our clients. The ODC has a very special place in my heart as I have seen many people do well because of ODC. 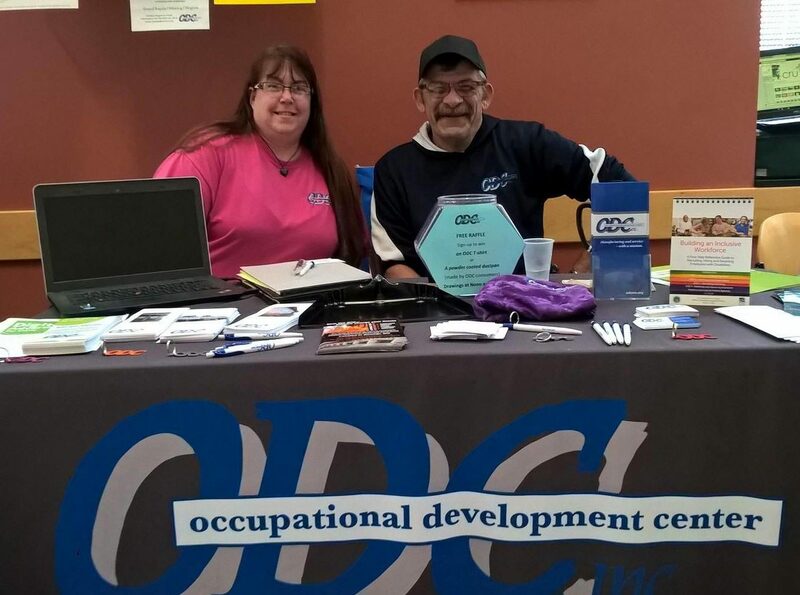 I would love to start with my daughter, Rebecca, who benefitted from ODC’s employment services for many years in Bemidji, eventually leading her to a job at Bemidji State University. Currently April is working at our business (Hardee's) in Int'l Falls. April's attitude is OUTSTANDING. Our guests love her as do our employees & management team. She is an excellent worker. We're proud of April and her accomplishments. The philosophy of Kiddy Karousel is based upon respect for the dignity and worth of an individual. We therefore recognize our obligation to instill in each employee a feeling of self-appreciation. We enjoy our staff who have come to us from ODC and have participated in your program for many years, with the intent of doing so going into the future. It's been really great to work with the ODC these past 12 years. We have Ariana twice a week and Alex every Saturday. They are the friendly faces our customers see when they walk in the door. We are continually impressed by the dedication they give to their work. They brighten the day for us and our customers - without them our weekdays would be much more hectic and not as fun. Having them around helps bring everyone together, not just at work but in the community as a whole. As a business that serves our community we benefit from our talented, diverse, hard-working individuals who are eager to explore their workplace potential. We value all our employees and are encouraged to see individuals with disabilities enhance their skills, talents and capabilities in our workplace. This has been promoted and supported by the ODC. The team members that we have added from ODC have been extremely reliable and hardworking. The positive attitude that they bring helps to keep morale higher in the departments that they work in. The communication between ODC, the team members and management at Menards has been great. We look forward to the continued success of the team members ODC has provided us. Happy NDEAM from the Roseau AmericInn. We are proud to employ people with disabilities, not just to "get the job done," though they do that and do it well, but because we all have strengths and limitations and I like to see people use and excel in their strengths and not concentrate on their weaknesses, whether that be a disability or something else. I look up to people who work hard and do the best job they can do at whatever is before them. This definitely includes people I have hired through ODC.